BugE - More than a bike, less than a car: Frame, suspension and steering. While the cowl paint is drying, other things can be done. First, the shock is installed on the frame. The default shock strength is set to a reasonable setting straight out of the box. No need to buy the bolts and nuts as they are included. The bolt holes were just a pinch too small so I had to use a rat-tail file to make the holes just a bit bigger. Note, the photo was taken with the old paint job. It was at this stage when I found the first hint that the old paint job might need to be stripped off. When I started adding on other parts, the paint started chipping and it was clear I had to redo the paint job. However, when the new paint was applied, the parts went on the same way. 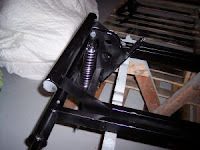 The rear swing arm assembly was reassembled as it was when it was shipped. Since some bolt threads were slightly damaged when I pounded it out for painting, I had to repair it. A jewelers file was good for doing this. Otherwise, the swing arm assembly went together just as it came apart. I added a pair of 12mm washers to the outside swing arm bolt assembly so the paint job is protected a bit more than it is in this photo. The swing arm and bumper bolts stick out but are harmless to leave in that state. The frame was then turned upside down. The brass bushings for the steering spindle were gently tapped in with a hammer and then attached to the front of the frame. 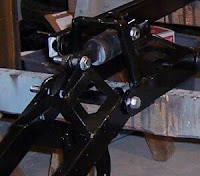 The tie rods and the stabilizer rod (below the tie rod) were then installed. On steering arm, some 5/16 washers were added as spacers to allow free movement of the tie rods. Post construction note: I originally had a stabilizer bar. However, the shock mount needed additional clearance. So, I could no longer use the rod. Instead, I created a retrofit that uses sliders instead. To date, this design change has worked well. The refit can either be installed at this time or at a later time in the assembly process. The upgrade can be seen HERE. The kit wheels and brakes parts are made by Tomas, one of the largest moped manufacturers in the world. The wheels come as a unit which includes a drum brake setup for each wheel and an integrated wheel bearing. The rear wheel also has a custom sprocket attached for the chain drive. Replacement wheels used to be available at http://www.tomasusa.com/. However, TOMAS A35 5-spoke mag wheels are still available HERE (both front, back and used ones). Replacement brake pads take an EBC-525 shoe. Another part number that would work would be a H302 which fits a Honda sports bike. The tires are moped tires that measure 2.50" - 16". The first measurement is the height off the rim. The second measurement is the rim diameter. Another acceptable tire is NR21 300-16 UNIV REAR STD from http://motorcycleproshop.com/ . When putting on the front wheels, a tire adjustment will be needed. This is because a three wheeled car, using two wheeler parts, will have one wheel tread “backward”. (the “arrow” on the side of the tire will be going the wrong way & tread will be backwards). Although it is possible for a person to change this with hand tools, having it done at a motorcycle shop is much easier since they have a special machine made just for that. However it is done, the tread needs to be reversed, then the tire re-inflated to 35 PSI. Once the tires are in place, it's time to adjust the tie rods. The recommendation is to have toe-in of about 1/2" so the tie rods don't bend. (that is, the front of the tires are 1/2" closer than the rear of the tires. After this is done, it will be time to mount the rear wheel and motor. If you are wondering how long this is all taking, I've itemized it below. However, time estimates for this project will vary dramatically from one individual to another. Three things extend time more for me. First, I'm blogging as I go so everything takes longer since I'm deciding on photos & verbage. Second, I'm keeping track of every part purchased and used plus adding notes as I go. So journaling all that takes time. Third, there are some pauses for decisions. For example, do I install a fan, two fans, 5 fans? How many coats of paint should I use for the frame? What shock mount position should I use? Should I drill out another cotter pin hole (and cut off the excess bolt) or do I use spacers? Do I use the DC-DC converter or an extra 12V battery or both? (and if I use an extra battery, what kind do I use and how do I mount it? All these little decisions and debates take time. If I was to do this again, I'm sure this vehicle would take much less time to assemble. 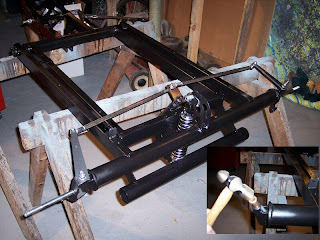 Re-assemble frame - 2 hours to assemble and cut off any excess bolt lengths & fix threads. Installing steering spindles, tie rods & stablizer arm. Then align. - 2 hours. Keeping track of parts & ordering additional items needed later - 1 hour. Enough hype - how much money would I save? More painting & installing a vent fan.